Whether you’re looking for a theme for to sell your handmade bows or simply want upgrade your existing e-commerce website, Cutie Patootie WordPress E-Commerce Theme is your solution. The Cutie Patootie WordPress E-Commerce Theme includes e-commerce capability with a high quality gallery system, and blogging platform. You can use or not use any system or section to suit your needs! Price: $44.99 $39.99 if you pre-order today! I am just as excited as the WooThemes crew to write this post to annouce that WooCommerce is now available for download! WooCommerce is an all-new plugin application and library of integrated themes for WordPress that help individuals and businesses turn their sites into professional, e-commerce stores. WooThemes aim for WooCommerce is to be an e-commerce toolkit that allows anyone to sell anything online. Are you ready to start selling your products on the WooCommerce e-commerce framework but need custom payment gateway, add-ons, or themes? Let us do all of the hard work while you focus on building your online business. WooCommerce customization rates start at $55 per hour. $55 per hour – Let’s get started today! 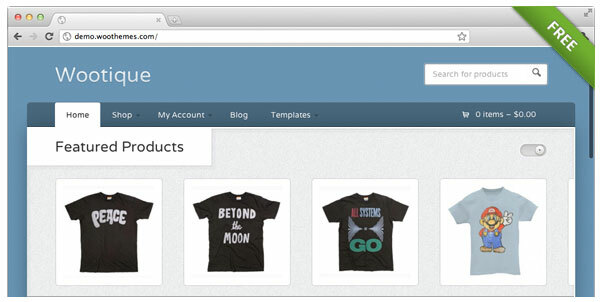 A FREE WooCommerce WordPress theme to get you started. Yes FREE! WooCommerce is a product made by the WooThemes company and is in no way affiliated with this site. Let us direct your attention to you the new BuySell Theme. The guys over at GetShopped.org commissioned this theme as a means to demonstrate just how customizable the WP e-Commerce Plugin really is. It was developed by the friendly theming folks over at the Tokokoo studios who specialize in e-Commerce themes. The WP BuySell Theme is an exceptionally beautiful theme based off the www.buysellads.com website design. Why did we do this? Because its full of beautiful design concepts that specifically relate to driving sales. If you want to use this theme on a live site we recommend you change the colors to suit the needs of your own brand and style, however in terms of layout then this Theme is deliciously hot and has been tested with all our Premium Plugins. Future versions will include pagination styling, different graphic for the sale price, and a slightly different checkout page. If you are wondering what happened to 3.7.6.6 well that was a minor release made as a quick version for some users, but was not tagged as stable, after more testing, and a few additional fixes we are proud to announce the new 3.7.6.7 version ready for consumption.